Melanie is an accomplished speaker who has delivered countless lectures at festivals, events and schools. She mostly speaks about the aurora, fusion energy, Everest and combining science with adventure. Melanie is represented by Northbank Talent Management. See contact page for details. Interweaving the science with a background of their history, folklore and changing landscape, Aurora brings together space, place and science in magnificent style. 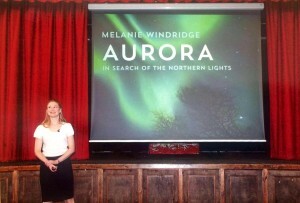 In a journey that takes her through Scandinavia, Canada and Svalbard, culminating in a spectacular solar eclipse, Dr. Melanie Windridge delves into the Northern Lights. Melanie has had some great feedback on this talk. People enjoy the mix of science with a personal, human story that draws them along. Fusion is the reaction that powers the stars – small particles colliding and combining produce huge amounts of energy with no greenhouse gases and no long-lived radioactive waste. This makes fusion the ultimate energy source and scientists have been trying to do it on Earth for decades. But it has so far proved elusive. 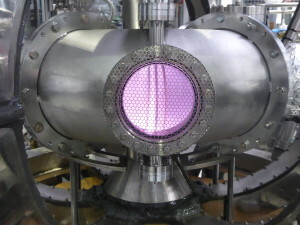 Looking at the history and the future of fusion energy, we consider why it has taken so long and how, with new technologies, we may be able to get to fusion faster. Mount Everest – the ultimate endurance challenge – is a place where science plays a huge part in performance and survival. 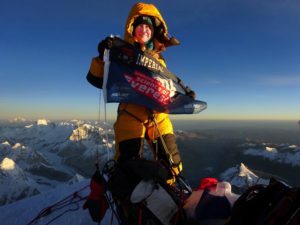 Dr. Melanie Windridge will tell the story of her own summit attempt and investigates how advances in science and technology enable ordinary people to reach the summit and survive the extremes. Contact us if you would like Melanie to speak at your event.